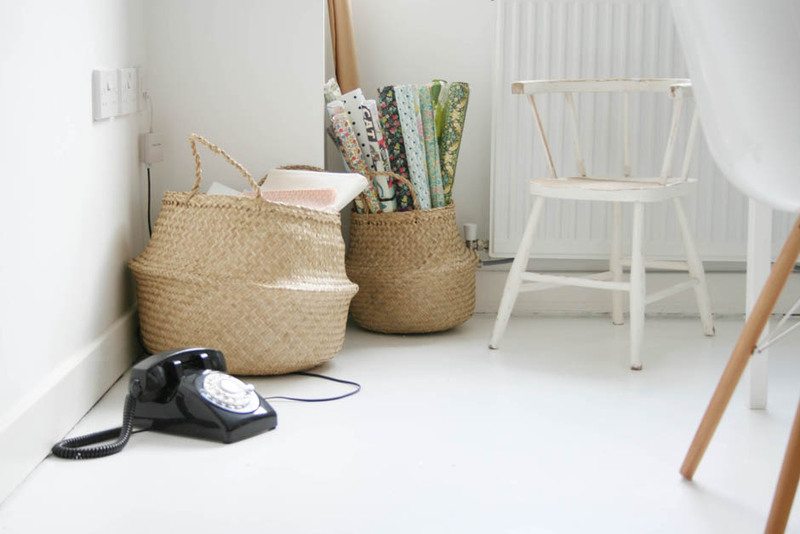 Yesterday was so much fun, seeing the first of the Styling the Seasons posts and photographs. Thank you so much to everybody who is going to take part (remember, you can share your styled surface on any day during September) and I hope that it has already helped you take a bit more time to reflect on the change of month and how to refresh your home – sometimes a jiggle around is almost as good as redecorating, I find. In brief, we sold the bed, ripped up the carpet, painted the MDF floor, removed everything from the left hand wall and cut the existing desk down to 150 x 70cm. We then bought another piece of MDF, exactly the same size, and painted it white to make a double desk. Neither of us wanted to face straight at a wall so I decided to place the desk in the middle of the room, which also means others can sit at it and I can use it as a very easily accessible sewing table and for pattern cutting. It is also good for taking photographs on from every angle. We had two trestle legs on the old desk, which we have kept and we have one each, and then I bought four more legs, which don’t take up the extra space trestle legs do. My desk chair is from the wonderful Out There Interiors and Jules has had his Herman Miller chair for ages. I slotted the cabinet in next to the window and it has sliding glass doors, which is perfect for the space and it’s where I store all my sewing bits. 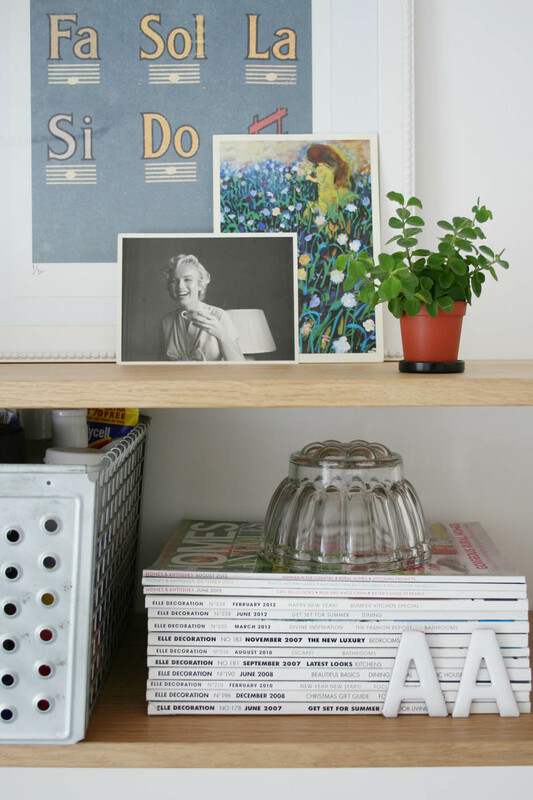 Find out more about it and the pegboard in my furniture makeover challenge post. The String shelving was a massive indulgence but is such a flexible shelving system that can broken up or added to (I want the cabinets and drawers) and can be moved to other rooms – I hope one day to have a whole wall of it). I have left the wall behind my desk completely blank so that I can take photographs against it and there’s also a set of drawers, that were in the old guest room, next to the door as you enter the room where I can leave on-going craft projects or take photographs. 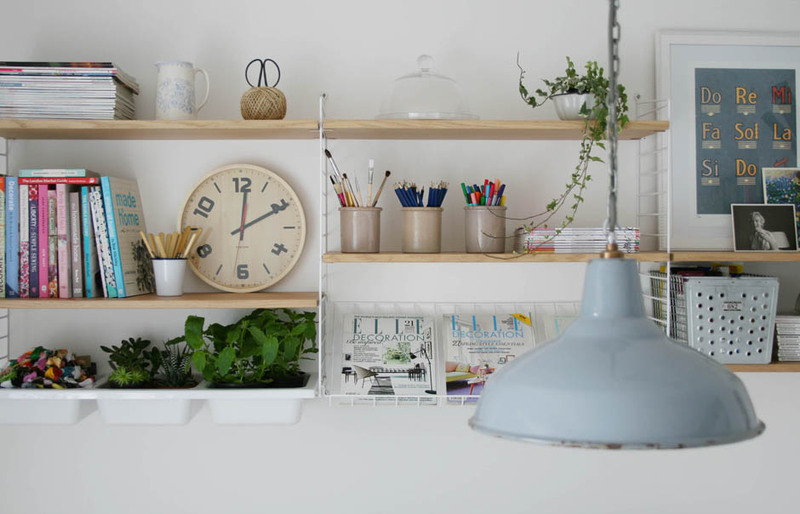 Did you see my first Styling the Seasons post yesterday that focused on my new String shelving? I love this Double Merrick print, which I used as colour inspiration for the room. 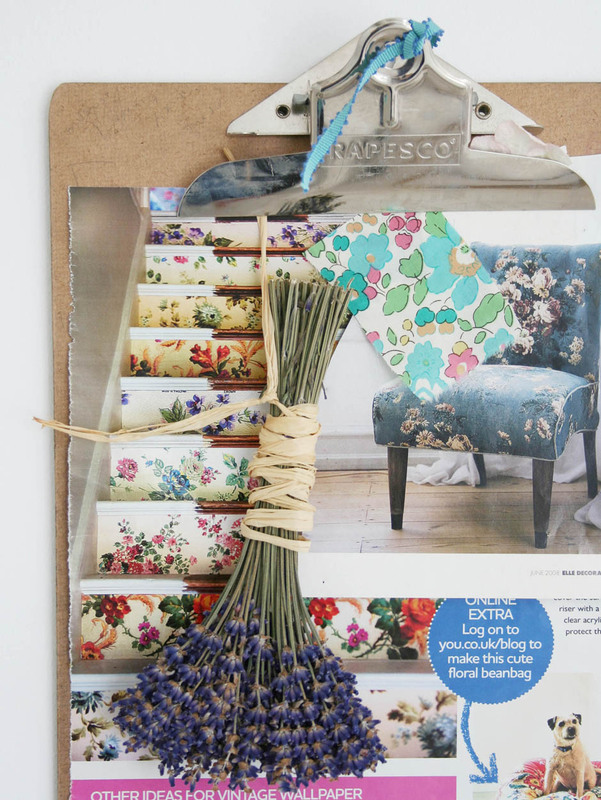 I have hung three clipboards on the wall for inspiration – pages of magazines, fabric samples, photographs etc. I love these baskets that I bought from Tea and Kate. One is full of fabric and the other with my wrapping paper and wallpaper stash. I still need to find a new home for the phone. I used Mini Moderns Peggy wallpaper to line this cabinet that I bought from eBay. See more on my Furniture Makeover Challenge post. I’ve added my Little Dane lamp from Loaf to this room because the colour works really well with the new pendant light and it’s nice to have a really soft light sometimes rather than task lighting, which the pendant provides. The cup is from Tea and Kate and the jadeite tumbler is from Liberty. 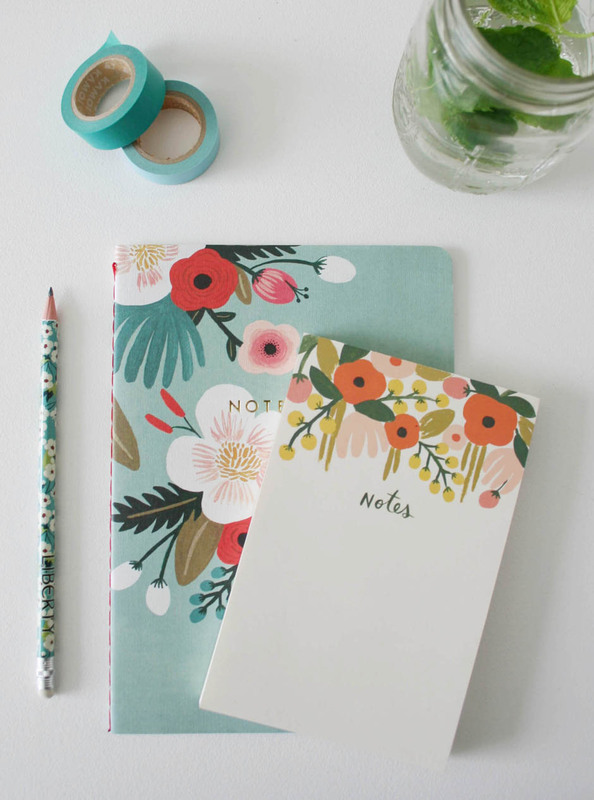 Totally in love with Rifle Paper Co notebooks that you can buy from Liberty. The vase set is from The Hambledon. 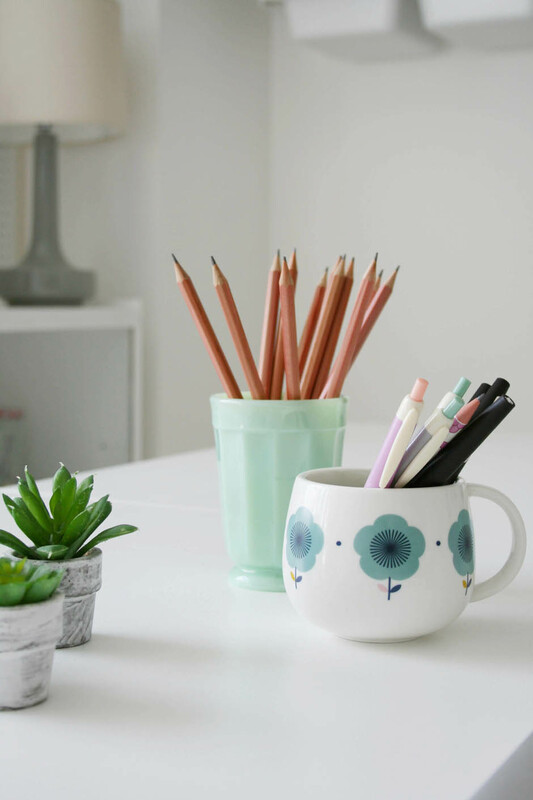 I think I am going to buy a big plant in a terracotta pot for the centre of the desk – partly so Jules and I can’t see each other and therefore there is less chance of distraction! I’m so happy it is finished and the light, bright feel of the room is so motivating. I had better get to work! I love it – especially the bold desk positioning. As you say perfect for cutting out on. Very inspiring! I run a home business and my desk is facing the wall which I feel I must remedy immediately after reading this post. 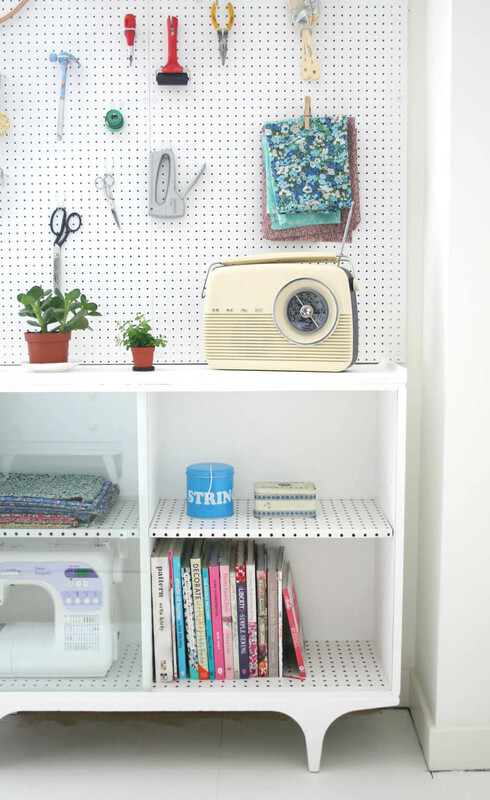 The up cycled cabinet with pegboard is also marvellous – a job well done! Just absolutely stunning! Love it – EVERYTHING about it! Enjoy working in such a beautiful space! Wow, looks great! I’m definitely a fan of moving a desk into the middle of the room too – just moved mine too. I love it. It looks so beautiful. I really like the shelves and the pops of nature and green you’ve managed to include everywhere! You are SO clever. Can you come and do my office now? 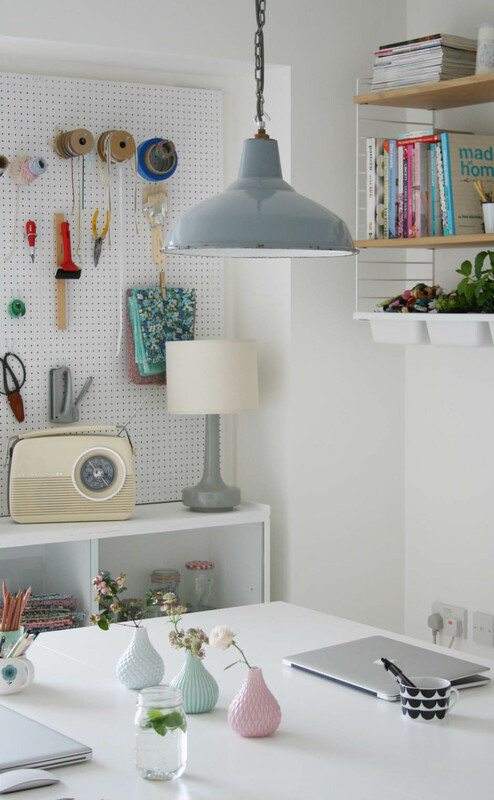 This is so pretty, I’ve been trying to find a pegboard for ages. I have a simple situation with a guest bedroom/office, might have to move it around now! What a transformation! 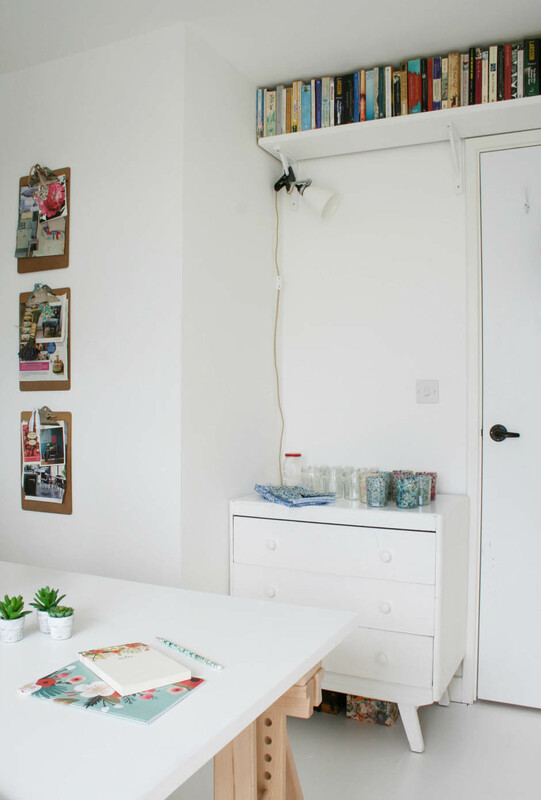 I really want to give my home office a makeover and I definitely think I’m going to use the idea of the table in the middle! This looks fab! You’ve got me looking around my home office now and wondering how I can re-organise it! Love your home office, looks so much better, the desk looks amazing in the middle! Stunning! I love whitewashing everything and then adding a splash of colour here and there. It looks like a room you will feel inspired to work in. 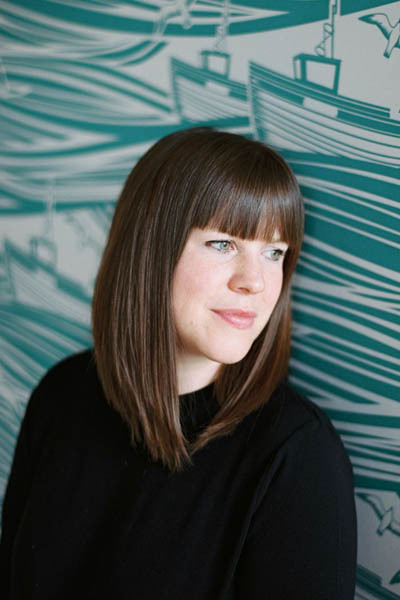 Thanks for sharing and also for letting me know about teaandkate, your cup sold it for me (ok, as well as the basket storage, vases, hanging clipboard’s etc etc). Looks great and yet so functional. Love it. So gorgeous! All of it 🙂 I also can’t work staring at a wall hence why I give our cupboard desk a miss and work it the dining room table! Just followed your link from Decor8. Wow! What a great studio/home office. All the white really amplifies the natural light from the single window. What I really love is how you managed to create a comfortable work space for 2 people to share–not always an easy task. Where’d you get the white chair (with wooden legs) from? I’ve been trying to find one under $70 but no luck.